Gloria J. Anderson, 55, of Atwater died on Thursday, Dec. 21, at Rice Memorial Hospital following a short struggle with cancer. Funeral services were held on Saturday, Dec. 23, at the Immanuel Lutheran Church in Atwater. Private interment was at the Union Cemetery in Atwater. Gloria Anderson was born on June 6, 1951, in Paynesville, the daughter of Katherine (Theis) and Victor Berg. She grew up in the Eden Valley/Manannah area, was baptized and confirmed at the Manannah Catholic Church and graduated from Eden Valley High School in 1969. About 1970, she was married to James Struthers. In 1972, she moved to Atwater. On Aug. 13, 1977, she was married to Mark S. Anderson. She was employed at the Larson Hardware, Hutchinson Technologies, and Innovex Company in Litchfield and prior to her retirement was a waitress at the Thompson Cafe and Bakery in Atwater. 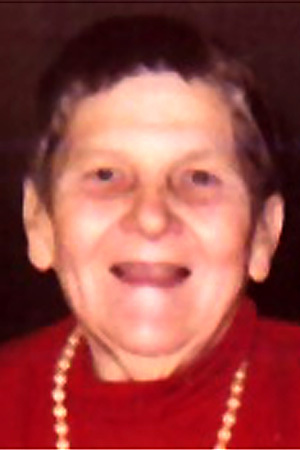 Gloria enjoyed being with her family, gardening, fishing, camping, and listening to country music. She is survived by her husband, Mark; two daughters, Debra (Brent) Ringler of New London, and Angela (Rodney) Olson of Willmar; two grandchildren; two sisters, Patricia (Rodney) Christensen of Paynesville and Jeannie Berg of Wahpeton, N.D.; and other relatives and friends. She is preceded in death by her parents; and brother, Pete. Wallace G. Dropps, 75, of Paynesville died on Saturday, Dec. 23, at the Paynesville Area Hospital. Mass of Christian burial was held at 11 a.m. on Wednesday, Dec. 27, at St. Louis Catholic Church in Paynesville. Burial was at St. Anne's Parish Cemetery in Kimball. Wally was born on July 3, 1931, in Buckman to Gustav and Mabel (Saeman) Dropps. He married Rita Flaschenriem on Nov. 9, 1968, in St. Anne's Catholic Church in Kimball. He lived in Kimball, Eden Lake Township, and Paynesville. He farmed and worked at the John Deere dealership in Paynesville for 21 years as well as for Fingerhut. He is survived by three sisters-in-law and two brothers-in-law. He was preceded in death by his parents; wife on Nov. 7, 2002; and 21 brothers and sisters. Roman N. Lahr, 86, of Paynesville died on Tuesday, Dec. 19, at the St. Cloud Hospital. Mass of Christian burial was held on Friday, Dec. 22, at St. Louis Catholic Church in Paynesville. Entomb-ment was held at the St. Louis Parish Mausoleum in Paynesville. Roman was born on Dec. 16, 1920, in Richmond to Mathew and Mary (Kinzer) Lahr. He married Marie M. Scheierl on Oct. 26, 1948, at Saints Peter and Paul Catholic Church in Richmond. The couple farmed in Paynesville Township for 36 years until their retirement in 1988. Roman was a member of the St. Louis Parish and Knights of Columbus Council #3820. Roman enjoyed being helpful on the farm, playing cards, fishing, and being involved with his grandchildren. Survivors include his two sons, Richard (Becky Koster) and Ronald of Paynesville; five grandchildren; five great-grandchildren; brothers, Math of Manannah, Clarence of Cold Spring, Tony of St. Cloud, and Art of Eden Valley; and sisters, Irene Arnold of New Hope and Lucille Lahr of Eden Valley. He was preceded in death by his parents; his wife; two infant children; four brothers, John, Marcellus, Eugene, and Albert; and one sister, Marie Dahart. Johanna A. Schefers, 92, of Lake Henry died on Monday, Dec. 18, at the Assumption Home in Cold Spring. Mass of Christian burial celebrating the life of Johanna Schefers was held on Friday, Dec. 22, at St. Margaret's Catholic Church in Lake Henry. Burial was at the parish cemetery. Johanna was born on Aug. 12, 1914, in Spring Hill to Frank and Mary Magdalena (Schoenborn) Winter. She married Edmund J. Schefers on June 11, 1935, in St. Michael's Catholic Church in Spring Hill. After their marriage, they moved to a farm at Lake Henry where they became members of St. Margaret's Church. Survivors include her children, Cletus (Carol) of Buffalo, Fr. Eberhard of Becker, Janet (Ronald) Fuchs of Paynesville, Lois Dandurand of New Prague, Robert (Doris) of Sartell, Eileen (Walter) Leither of Cold Spring, and James (Audrey) of Anchorage, Alaska; 23 grandchildren; 33 great-grandchildren; and sister, Otillia Jonas of Melrose. She was preceded in death by her parents; husband; one infant son; one son-in-law; and brothers and sisters, Henry, Lorence, Edward, Theckla Jonas, Alfred, Sofia, Erma Kunstleben, Leona Meemken, Arthur, Sarah Fuchs, Ervin, and Richard. Ole Sonstegard, 92, of Paynesville died on Wednesday, Dec. 13, at the Paynesville Area Hospital. Funeral services were held on Monday, Dec. 18, at Paynesville Lutheran Church. Burial was at Crow River Lutheran Church in rural Belgrade. Oleen Sonstegard was born on Nov. 26, 1914, in Georgeville, Minn. He was the son of Peter Olaf Selma (Stenerson) Sonstegard. He grew up as part of a large family in a farming community. He attended the University of Minnesota, graduating in business agriculture in 1941. He married Margaret Wilcox on July 3, 1943, in Anoka. In 1960, he joined Marshall Foods. Ole and Margaret made Paynesville their home for over 40 years. The business of farming, raising turkeys, and dairy cows was Ole's life work. He also enjoyed serving the community of Paynesville as a member of the hospital board and the Paynesville Lutheran Church governing board. Although he was a true businessman, his passion was Margaret, his children, and grandchildren. He leaves memories of his farming, cabin days, lots of good advice, and his quick wit. Ole's family is his wife, Margaret; four children, Judie (Harry) Buerman, Jean Wentzel, James (Kathy) Sonstegard, and Janet Sonstegard; and nine grandchildren. In lieu of the flowers, memorials should be directed to the family for Camp Courage. Hailey Lynn Wendlandt, five months and 24 days, of Paynesville died on Wednesday, Dec. 13, at Hennepin County Medical Center in Minneapolis from injuries sustained in an automobile accident. Funeral services were held on Monday, Dec. 18, at Nordland Lutheran Church in rural Paynesville. Burial was at the church cemetery. Hailey Lynn Wendlandt was born on June 19, 2006, at Rice Memorial Hospital in Willmar, the daughter of Cory Wendlandt and Bethany Adey. She lived with her parents and sister, Alexa, in rural Paynesville. She was a strong baby with beautiful, big, blue eyes. She was known as "hay bug." She was an especially happy baby, who loved to giggle, smile, look at the dog, play with her sister, and be held. She is survived by her parents, Beth Adey and Cory Wendlandt of Paynesville; grandparents, Kip and Judy Wendlandt of Belgrade, Terra Lexow and special friend Red Newville of Spicer, and Kevin and (Wendy) Adey of Sunburg; great-grandparents, Rita Jaeger of Paynesville, Darlene Wendlandt of Belgrade, Carole (Maurie) DuBois of St. Francis, and Lee (Mary Sue) Adey of Edina; and many aunts and uncles. Joyce E. Felling, 78, formerly of Paynesville, died on Sunday, Dec. 3, at St. Benedicts Senior Community in St. Cloud. Mass of Christian Burial was held on Thursday, Dec. 7, at St. Louis Catholic Church in Paynesville. Interment was at the church cemetery. Joyce E. Felling was born on Jan. 23, 1928, in Elrosa, the daughter of Nick and Anna (Schroeder) Koll. Joyce was baptized into the Christian faith at Saints Peters and Paul Catholic Church in Elrosa. She attended elementary school at a district school in rural Elrosa. In her late teen years she moved to St. Cloud where she graduated high school from St. Cloud Tech. In 1958, she was united in marriage to Richard Felling. The family lived in Belgrade until 1961 when they moved to Manannah. In 1980, Richard died. Together, they shared 22 years of marriage. In 1991, Joyce moved to Paynesville where she lived until 1995 when she moved to St. Cloud. Joyce was member of St. Louis Catholic Church in Paynesville. She enjoyed the farm life, flowers, and gardening vegetables. Joyce loved her family, especially time with her grandchildren. She was preceded in death by her parents; husband, Richard; and siblings, Roy Koll, Everett Koll, Donald Koll, and Doris Fauskee. She is survived by her son, Richard Felling of Paynesville; three grandchildren, one great-grandchild, and brother, Ralph Koll of St. Paul.